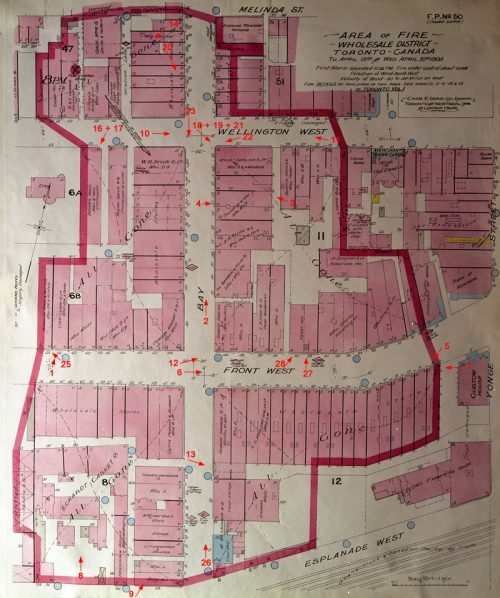 Numbers under the photographs show the location of buildings on the map below. Exactly how the fire started has never been solved. Early reports suggested that faulty electrical wiring was to blame. Others thought that a stove left burning at the end of the work day was the cause. 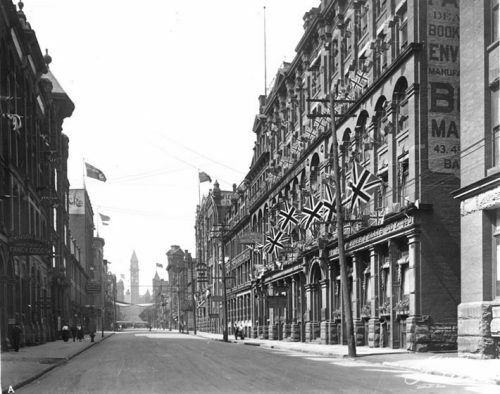 Whatever the source, by the time a watchman saw flames and sounded the alarm at 8:04 pm on that icy night of April 19, 1904, the Wellington Street building in which it had started was already a loss, and the fire was spreading to its neighbours. Map copyright CGI Information Systems and Management Consultants Inc. This plan was drawn for the use of insurance companies. The black cross in the pink circle in the upper left-hand corner shows where the fire began. The red numbers and arrows, added for this web exhibit, correspond to the red numbers underneath each picture in this exhibit. They show the location and direction of the pictures. The street that runs from left to right in this photograph (where people are walking) is Bay Street. The ruins fronting on Bay at the extreme left are those of the G. Goulding & Sons building (see next photograph). The high façade sticking up in the centre of the skyline (with what looks like an antenna) may be, or may be next door to, the building where the fire started. While the outer walls of the buildings were brick or stone, the joists, floors, and interior walls were wooden. 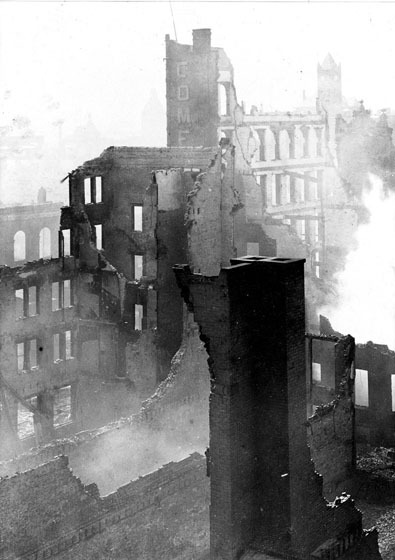 Open stairwells and wide storage spaces filled with cloth, paper, and other flammable goods allowed the fire to sweep through fast, leaving only the stone outer walls remaining, and sometimes not even those. 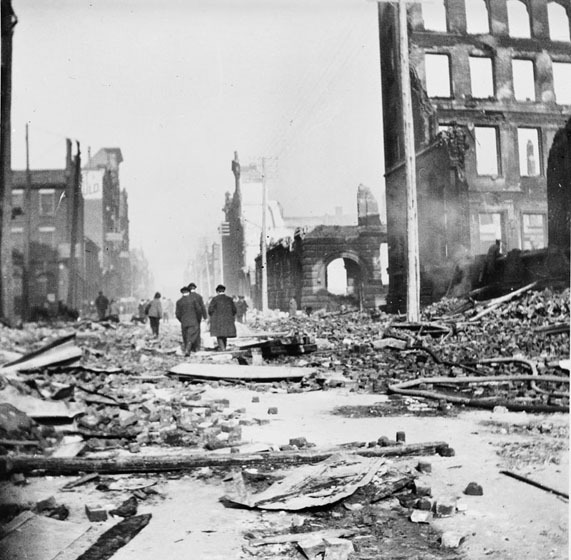 While the mayor sent telegrams to other cities, urgently asking for help, the fire’s northward advance was stopped. 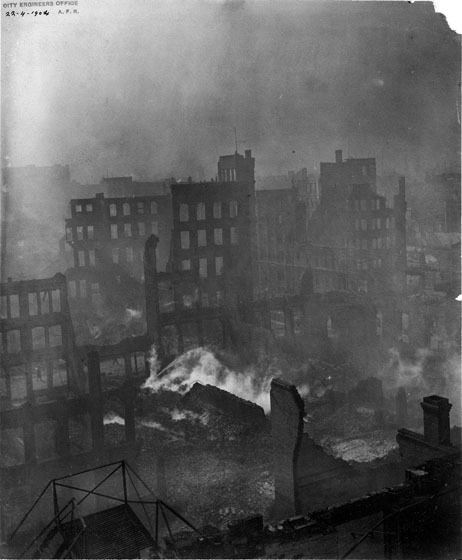 But the fire continued south and east, and by 11 pm, it had reached Front Street. From there it swept south to the Esplanade, and east along Front towards Yonge Street. 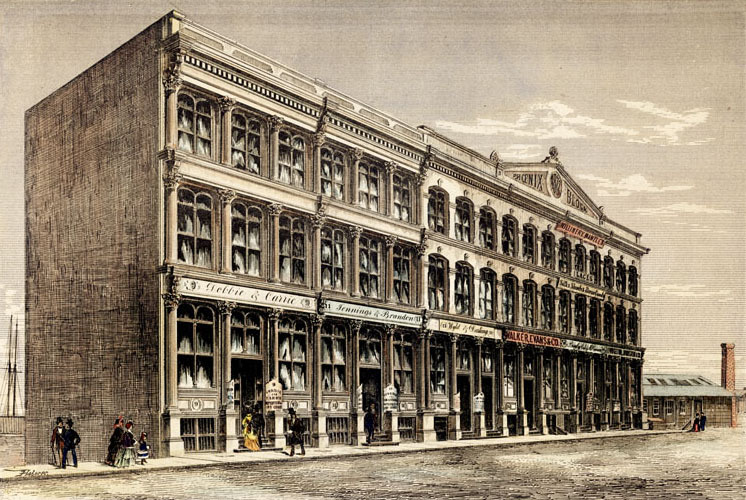 This row of buildings, named the “Phoenix Block,” was built in 1872, probably to replace others destroyed in another fire. 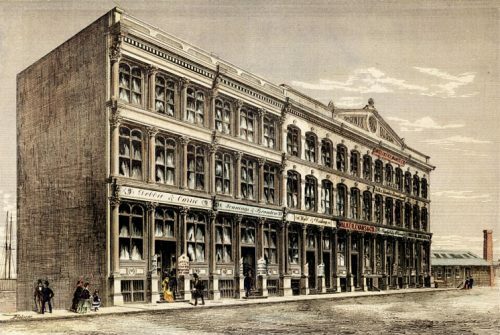 The tenants at number 13 are Wyld and Darling, whose later warehouse at Bay and Wellington streets was destroyed by the 1904 fire. The triangular facade of the ruined Phoenix Block can be seen in the centre of this photograph. Note the fallen telegraph and electrical wires, which caused difficulty and danger to the firefighters throughout the fire. Fire fighters and equipment from Toronto’s surrounding suburbs, and others arriving by special express trains from Hamilton and Buffalo, arrived in time to help Toronto’s exhausted fire fighters make a last stand just west of Yonge Street. Some on the ground, some climbing to the roofs of untouched buildings to get above the flames, for two hours they soaked the advancing edge of the fire. Finally, by 4:30 am, the fire was declared under control, though small fires continued to break out for the next few days, and the ruins smouldered for two weeks. This is probably the site of the Eckardt Casket Company. The high ruins with the window openings in the distance are the backs of facades fronting on Front Street. The tall smokestack of the Eckardt company (see previous photograph) can be seen at the extreme left. The tall smokestack at the right of the picture belongs to the M. McLaughlin & Co. mill, as does the stone building just in front of it. The two water tanks on the skyline at the centre of the picture mark the Kilgour Brothers factory. 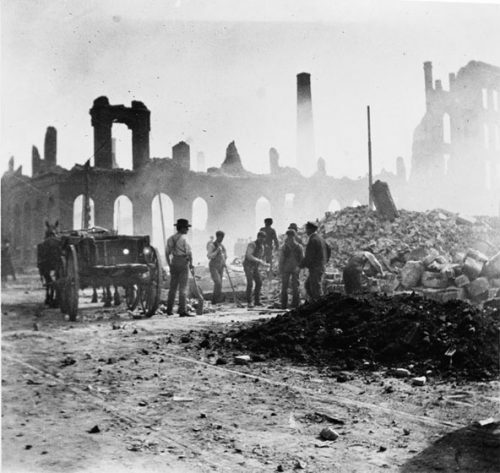 Miraculously, although many fire fighters suffered minor injuries, particularly temporary eye damage due to smoke and cinders, no one died in the fire. Financial losses were another story. 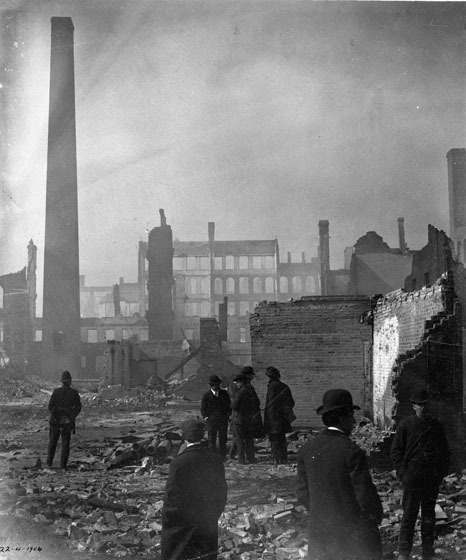 Total estimated losses were $10,000,000—in 1904 dollars. 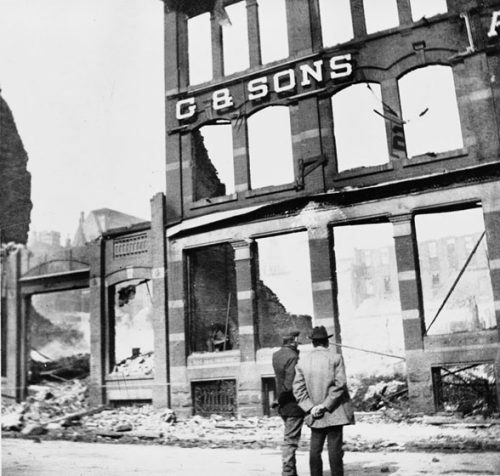 Most businesses had insurance, but even so, some lost tens of thousands of dollars. Five thousand workers lost their jobs, temporarily or permanently. 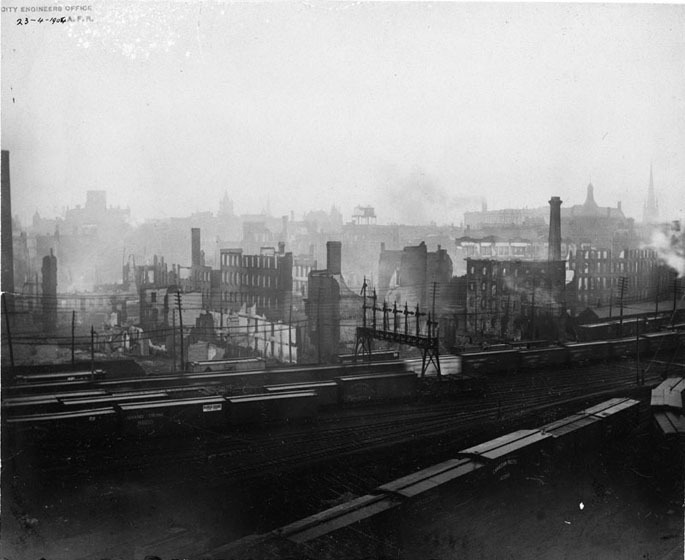 The insurance companies suffered serious losses, but earned no one’s sympathy when they raised all insurance premiums for businesses in the affected area by 75%—retroactive to the night of the fire. 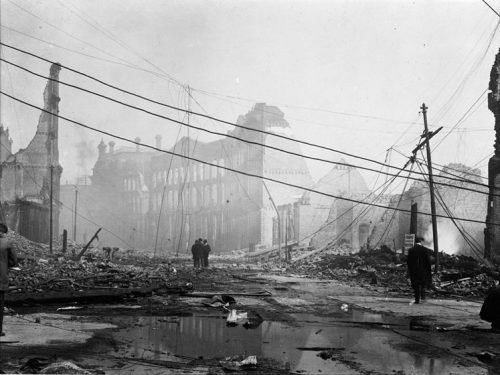 As the burning buildings collapsed, they filled the streets with rubble, as visible here. Astonishingly, some wooden telegraph poles are still standing. The stone arch at the centre of the picture is the Wyld-Darling building; the Brock building is on the right. 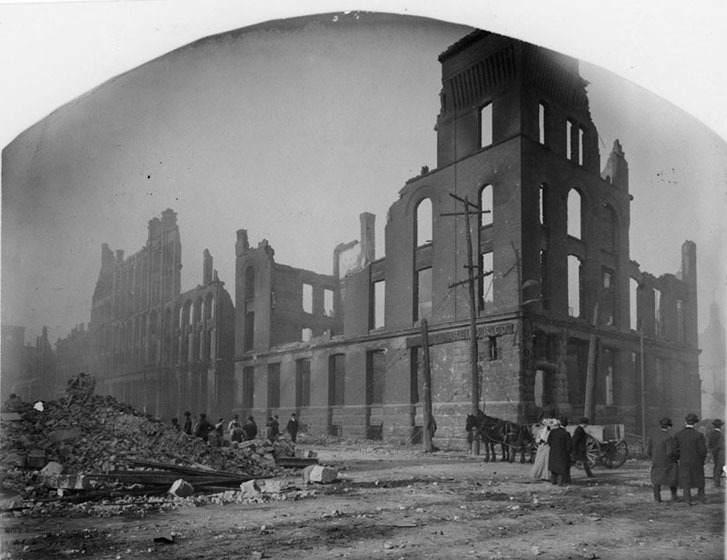 The building where the fire started is behind and to the left of the photographer. All of the rubble had to be cleared away by hand. Some of the male workers thrown out of work by the fire found employment doing this work. 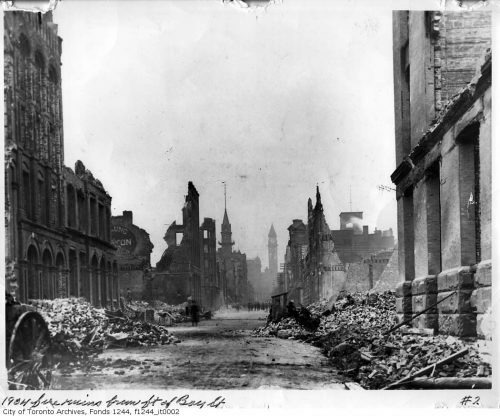 The tall fragment in the centre reads “Comfort Soap.” The tower to its right is that of the Union Station of the time, which was far enough west to escape the fire.